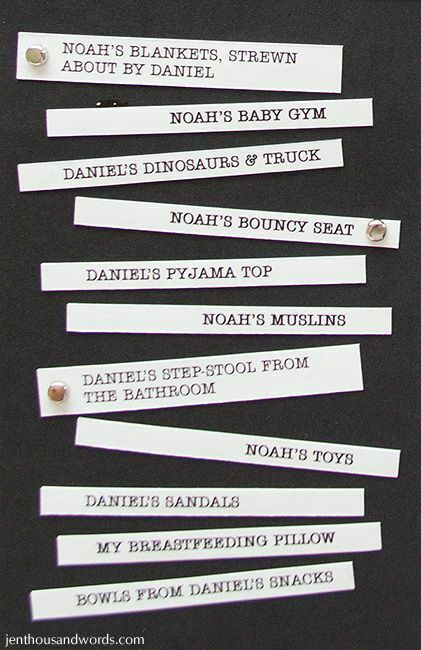 When Daniel was a toddler and Noah was a baby I used to get frustrated with the mess in my house. Those of you who have tried to tidy up with little ones around know what I'm talking about. So I tried reframing the experience. 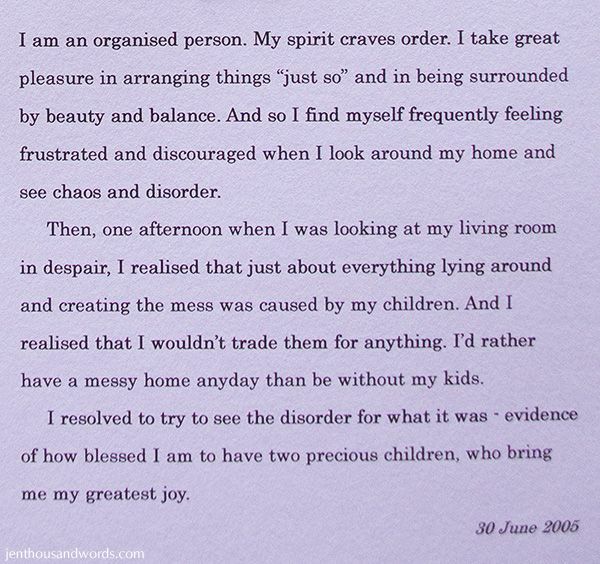 I realised that none of the mess I had would be there if I didn't have my beautiful children - and I wouldn't trade them for all the clean houses in the world. Do you know what the funny thing is? My kids love photos like that. Anytime I have pictures which show their toys / mess they just pore over them. Because the thing is, your messes change over time. They evolve with your family and with your life. One day it's baby gyms and rattles, the next it's iPods and boat-sized stinky teenage boy sneakers. One day it's sparkly fairy dress-up costumes, the next it's a dining table covered in punches, paper and ribbons as you assemble her wedding invitations. So why not document your messes? 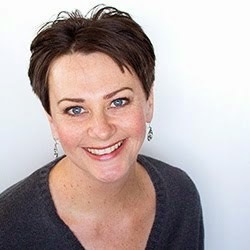 I'm not talking about reveling in filth - let's assume a basic amount of cleaning goes on for hygiene's sake - I'm talking about capturing the details of your family (or just yourself!) living life and make glorious evidence-of-joy messes along the way. So today I went into the playroom and took a photo of it just as it is. 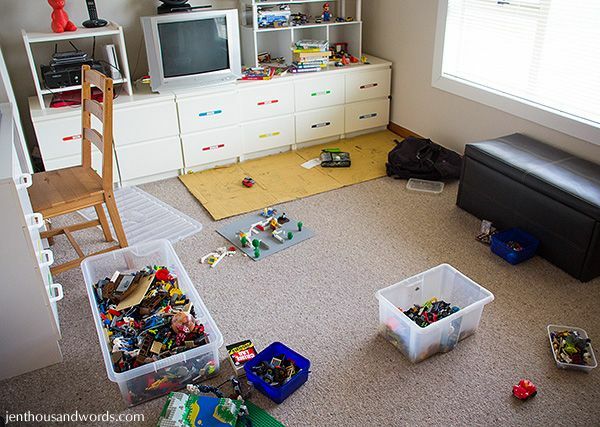 It's not much, but it's a glimpse into my boys' lives that is different to how their space looked a few years ago and differnt to how it will look in years to come. So now it's your turn. Look for the story in your mess. Seek out the evidence of your joys. A messy kitchen might show how much you enjoy cooking or baking, and that it is something you are interested in at this stage of your life. You are exploring a talent - that's a blessing. You have mouths to feed - another blessing. A mound of laundry shows that your family is healthy and active and busy. How lucky we are to have washing machines - think of tackling your piles of washing a hundred years ago and how hard it would be. 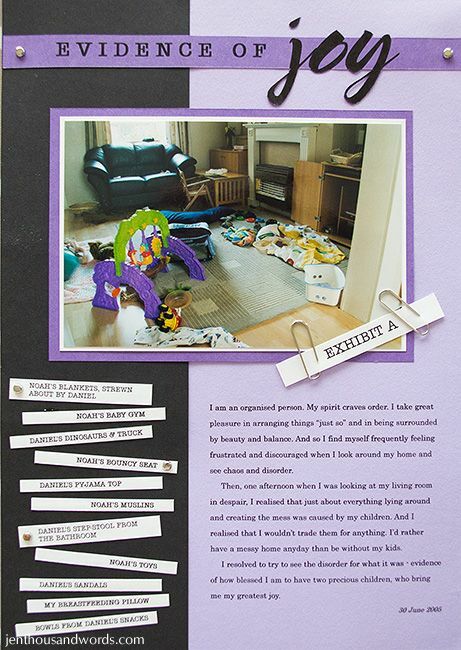 Toys underfoot shows that you have little ones in your care, to cuddle and teach. I don't wish back that time (it was hard!) but I do wish I could have my babies back to cuddle again, just for a day. Crafty bits strewn around show that you have immersed yourself in creating something. Celebrate and capture that. Piles of papers show that you work hard. Or perhaps you are putting of doing your filing because you have more intersting things to tackle. Maybe you are working out a difficult insurance claim or something similar - record it anyway, even if it's not evidence of joy right now. The joy lies in the fact that it will pass and you will look back and remember and be glad you no longer have to deal with it. Please share your messes below. 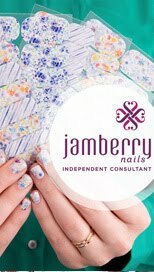 If you don't have a blog then I'd love it if you'd drop me an email or leave a comment below. If you'd rather do neither, then please at least consider capturing your mess for yourself to look back on one day. You'll be glad you did. P.S. This is my first time hosting a link party, so if there are teething problems please bear with me!